Completely change the color of an element, or elements, in your image. 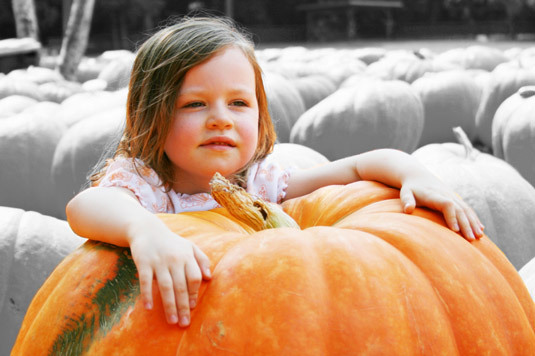 Look below to see where the field of pumpkins behind the girl was painted with the Color Replacement tool using the color black. Eliminate red-eye (or yellow-eye in animals) if other, more automated methods don’t work to your satisfaction. The Color Replacement tool replaces the color in your image with the foreground color. What is particularly nice about the Color Replacement tool is that it preserves all the tones in the image. The color that’s applied isn’t like the opaque paint that’s applied when you paint with the Brush tool. When you’re replacing color, the midtones, shadows, and highlights are retained. In Expert mode, select the Color Replacement tool from the Tools panel. The tool looks like a paintbrush with a small blue square next to it. Press B to cycle through the Brush, Impressionist Brush, and Color Replacement tools. You can also select any of these tools and then choose your desired tool from the Tool Options. In the Tool Options, choose your desired brush tip from the Brush Preset Picker panel. Further adjust your brush size as needed. Then adjust the hardness, spacing, roundness, and angle under Brush Settings. Color: The default, this mode works well for most jobs. It will change the color without changing the brightness levels, thereby retaining your tonal range. This mode works great for eliminating red-eye. Hue: Similar to color, this mode is less intense and provides a subtler effect. Luminosity: This mode, the opposite of Color, doesn’t provide much of an effect. It changes the brightness levels, with no regard to color. Contiguous replaces the color of adjacent pixels containing the sampled color. Discontiguous replaces the color of the pixels containing the sampled color, whether or not they’re adjacent. Tolerance refers to a range of color. The higher the value, the broader the range of color that’s sampled, and vice versa. Continuous allows you to sample and replace color continuously while you drag your mouse. Once replaces color only in areas containing the color that you first sample. Background Swatch replaces colors only in areas containing your current Background color. Antialiasing slightly softens the edges of the sampled areas. Click or drag your image. The foreground color replaces the original colors of the sampled areas. If you want to be very precise, make a selection before you replace your color.